January is over and it is time to report our achievements. We, in our company, decided that this blog would report our business trading revenue only and not my personal dividend growth strategy. But then we received a few emails from our readers that they wished to see those dividend reports here on this blog as well as more dividend investing insights. We listened and decided to keep and continue reporting and writing about dividend investing here. We would, however, split our report into two posts now on. One separate post, for dividend growth investing, and a second, separate post, for options trading reports. Here is the first part – January 2017 dividend record. I am happy to say that this month, our dividend income came in better than January last year. Last year, we made $81.80 in dividends, this month, it was $87.13 dollars. I am glad to see that our dividend revenue came in higher than last year and hopefully this trend would continue in the following months. In 2015 and partially 2016 we saw a few companies in our portfolio slashing their dividends and two companies even stopped paying dividends entirely. This affected our portfolio and our dividend income. It seems the trend is reversing again and our dividends might be going up again. 1) The companies which reduced their dividend were in oil business and my thinking was that oil glut will not last forever. I am invested in these stocks for long term. Sometimes in the future, they will be increasing the dividends again. I believed in those companies. And some are improving again. 2) The other stocks which cut the dividend entirely dropped in price so much that it made no sense selling them. For example Legacy Reserves LP (LGCY) stock dropped from ~$30 a share all the way down to 0.61 a share! It’s current price is $2.57 a share today. I invested in this stock at $12.40 a share and currently sitting on 86.94% loss.At some point I was losing the entire investment. So why selling. If the stock would go bankrupt, I wouldn’t lose any more money than I was already losing. Thus I decided to sit tight and do nothing. If the oil glut ends at some point and oil prices will go up again, this company may still be here and I may recover all money or even make money. This is just a reminder of a strategy we use in our IRA account. We primarily invest into high quality dividend growth stocks (exceptions are allowed, such as oil plays), reinvest dividends using DRIP and grow the dividends. We also use options trading selling cash secured puts to buy the stock of our interest, collect dividends, sell covered calls, and sell the stock. The options strategy is different than the one we use in our trading account. We do not roll the options to avoid assignment in the ROTH account as we do it in our trading account. So we sell a put and if the put ends in the money at expiration, we let it assign, buy 100 shares of the stock, keep the stock, collect dividends, and sell covered calls as long as we sell the stock again. While holding the stock, we collect dividends. And because of the DRIP feature the dividends are reinvested. There fore at the beginning when we get assigned, we buy 100 shares. After the dividend is re-invested, we end up with, for example, 102.83 shares. When our covered calls are assigned and we sell 100 shares we still will have 2.83 shares carrying the dividend into the future and slowly growing. You may ask why doing this and not keeping the stock? Well I want income from selling puts and calls while sitting on the stock would bring dividends only. For this reason I have certain money in my ROTH account dedicated to be used for this purpose only – selling puts – getting into a stock – collect dividends – selling calls – getting out of a stock – selling puts – getting into a stock… and so on and on. As I mentioned above my dividend income was better than last year. I made $87.13 in dividends and all dividends were reinvested back to the companies which generated them. The account is up 3.37% from previous month. This month, we didn’t purchase any dividend stock to our portfolio except dividend reinvestment and options triple play strategy, see below. The goal for upcoming month is to save cash for dividend plays withing the account. We want to create enough revenue inside the account which can be re-invested into dividend stocks. As of today, we only have approx. $2,767.42 dollars in ROTH IRA available for options trading. The goal in 2017 is to reach $6,000 available dollars for options trading. With that money available for trading, in January 2017, we generated $118.00 dollars income from options 4.26% return on invested capital. This month, we traded options using stocks Ensco plc (ESV) and Energy Transfer Equity, L.P. (ETE). For ETE stock we used a triple play – dividend capture strategy we described in this post. Currently, we purchased the stock to capture the dividend. The dividend ex-day will be in February 3. As soon as we purchased the stock via cash secured puts, we sold a new covered call. If the stock stays below our covered call strike ($19.00) then we should capture the dividend (if the stock stays above the strike we may get an early assignment, although I do not expect it since we trade long term contracts). With all collected premiums our cost basis is $17.47 per share. We got assigned at $19.00 a share, expecting 0.28 a share dividend and hopefully sell the stock at $19.00 a share. This would leave us with a nice $153 cash or 9.53% profit or 83.98% annualized return. The play is still under progress so I will be able to report it next month. Recently, I have seen many dividend investors I follow selling their dividend stocks in expectation of the market imminent crash. They are afraid that valuations of the stocks are too high and not justified. But because the stock market is expensive doesn’t mean that it cannot become even more expensive. Currently, the stock market is trading at 21 P/E and historically, it is not any overly high number. We still may see the market going higher. And as Keith McCullough, the CEO of Hedgeye.com, who was a bear for the last few years, says that “Investors who are positioned for a correction are positioned for a failure”. We must not forget that the US economy is indeed picking up and strengthening. The growth will be at some point catching up with the market. But not only that, it will push it higher. We also have a few seasonal historical trends such as Dow hitting and moving above 20,000 mark. While many are scared of this event and see it as an Omen for the market, historically, Dow actually went up higher whenever it crossed its “thousands” level (also other markets will follow although it is said that S&P 500 will lag the Dow). My expectations are a further gains of S&P 500. But even if the market fails to make new highs and corrects I will consider it a great opportunity. However, I strongly refuse predicting the market and liquidate my positions just because I may think that the market is expensive and may crash. It took me about 5 years when I finally realized what I wanted from my investments and build them to the level I have them now. Liquidating it now would be destroying all I have built so far. For example, when I invested in JNJ for the first time ever, my yield was 2.50%. Today, after patiently sitting on my investment and reinvesting the dividends, my yield on cost is 5.28%. If I sell it all today, I will be starting again with 2.50% from scratch. When I was learning about dividend growth stocks and dividend growth investing, one of the rules I learned was that you stay invested even if the market crashes because you will be reinvesting the dividends into a cheap stock. And stocks like JNJ actually raised dividends during 2008 selloff. 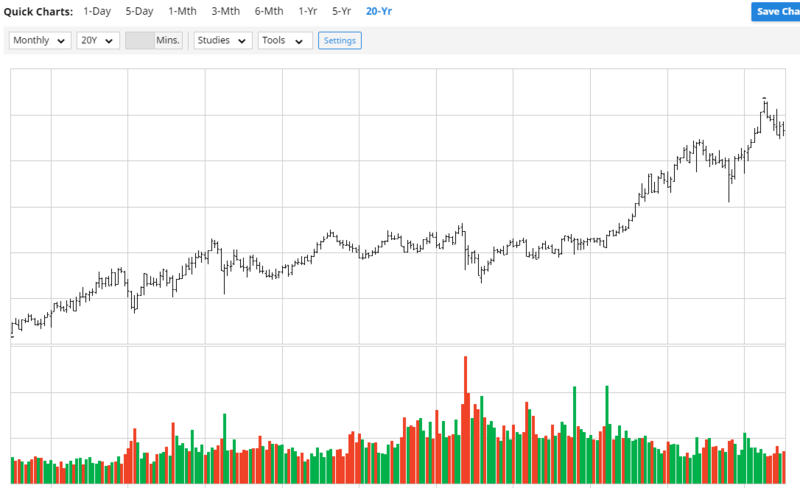 Here is a 20 year chart of JNJ. I left the price axis and time axis out of the chart. Can you guess which of the selling dip is the Great depression selling? And now, imagine that we are invested in this portfolio for the next 20 years. That’s exactly the same time frame as in the chart. If the next 20 years would look similar, there is no reason to freak out about today’s prices you may consider too high. Did you guess which sell off on the chart was 2008? Well, check it out here whether you were correct or not. And now tell me, why should you be selling when you are in for this time horizon? Dividend cuts are the worst, I usually pull out of a stock when there is a dividend cut and cut my losses. The waiting game so far for me in the past hasn’t paid off ever. The goal wasn’t achieved but there is still a growth from last year so it doesn’t look so bad, still time to recover for the rest of the year. I agree with you but I was late to the game. When the stock fell down it really makes no sense selling the stock for 0.80 cents, so I decided to wait. Some companies I decided to wait on purpose. Great job with your growing dividend income from last year. That’s the name of the passive income game. Create an ever growing passive income stream. Between your dividends and options premiums I think 2017 will be a good year for your income generation. Also liked that chart above w/o the price axis and time axis. It really gives you a great long term perspective and shows that even major declines are just “blips” on long tern charts. Something to think about. Thanks for sharing. Keith, that was exactly my point and take away from those charts. You nailed it as it really was a blip. The 2010 drop was actually even bigger compared to 2008 sell off. So why panicking now about prices when they may go even higher. Selling now on a presumed valuation really is not a dividend growth investing. And yes, I am happy to see that my dividends are growing again. I bet it is the DRIP picking up :). Also my options trading was excellent this month so if it all goes well like this it will be a great year and great income to invest.